• Provides power for two buses of DALI-compliant digital addressable loads. 128 mA guaranteed current, 250 mA maximum supply current per bus. 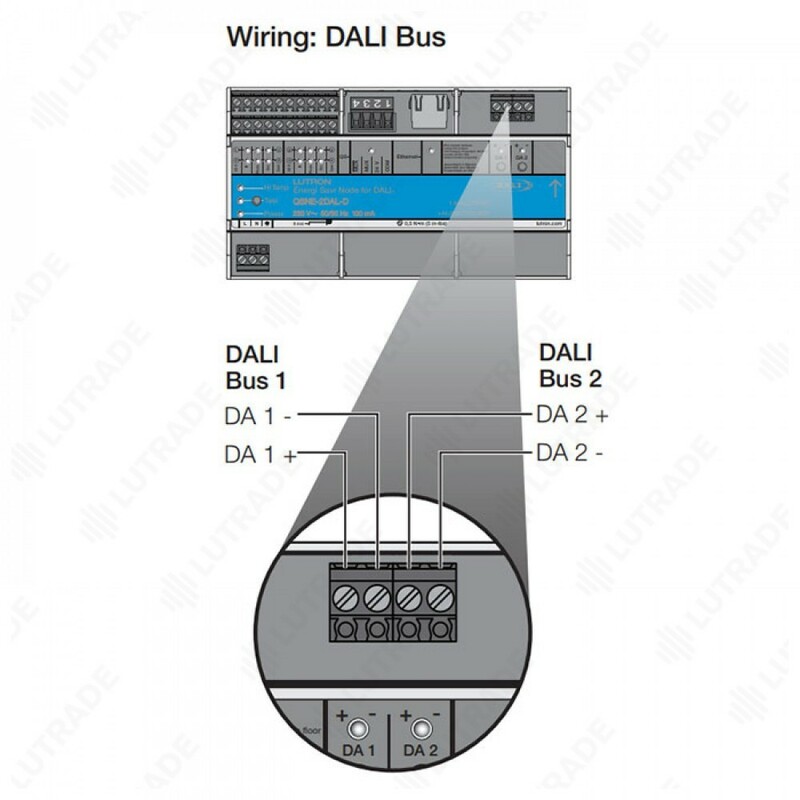 • Each DALI Bus can control a maximum of 16 zones. programming in the event of a power loss. • Default configuration requires no commissioning. 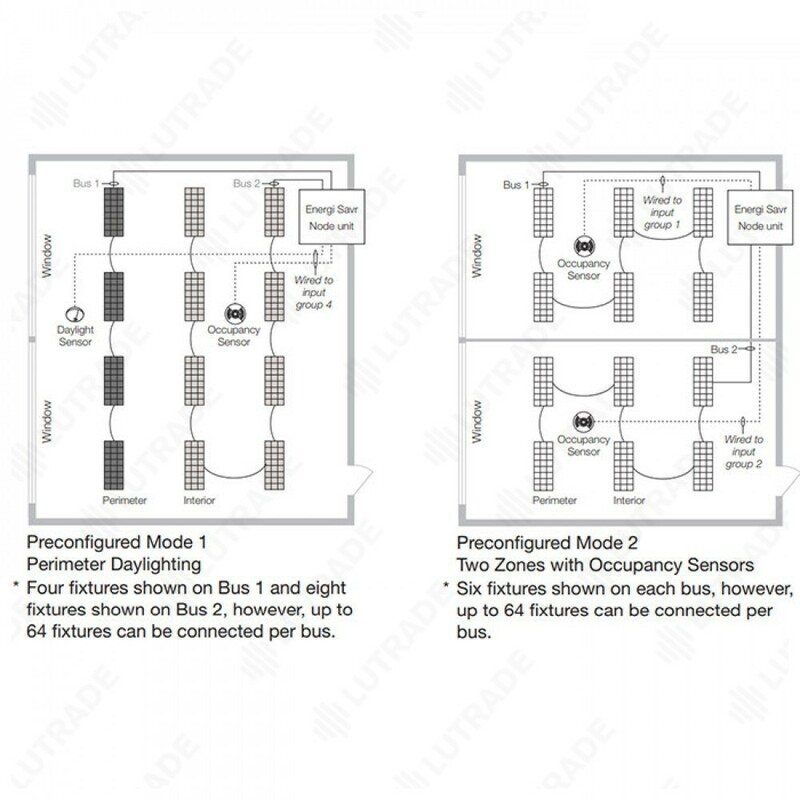 • Four occupancy sensor inputs for automated control of lights in areas. • Four daylight sensor inputs automatically adjust light levels based on the amount of natural light entering through the windows. • Four IR receiver inputs for personal control. • Includes QS link for seamless integration of lights, motorized window treatments, control stations, and QS Sensor Modules. 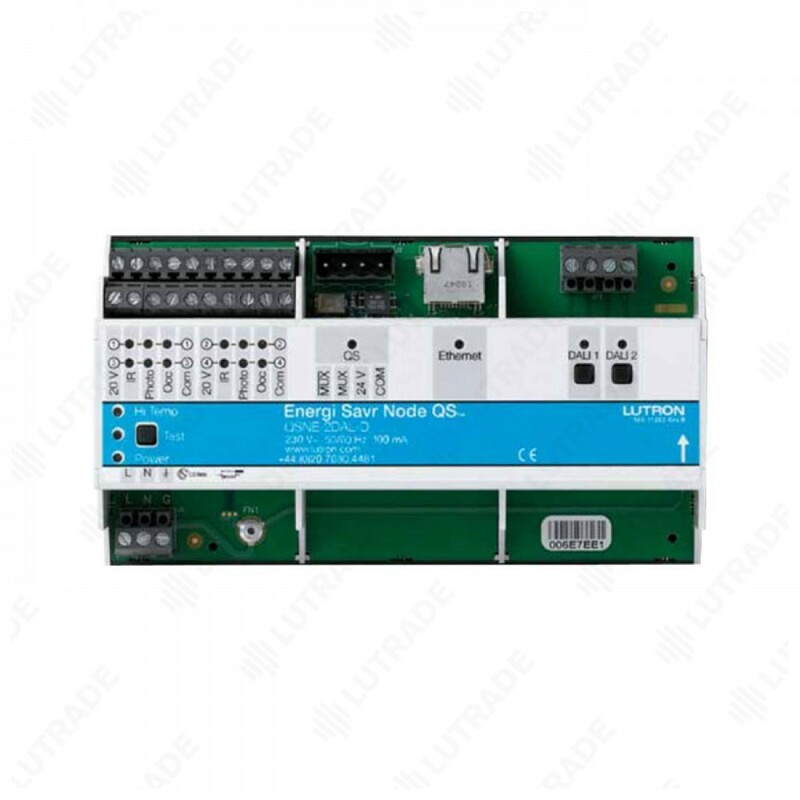 • Energi Savr Node units and QS Sensor Modules can be used in a Quantum system to control and manage light in an entire building. • Lightning strike protection meets ANSI/IEEE standard 62.31-1980. Can withstand voltage surges of up to 6000 V ~ and current surges of up to 3000 A. 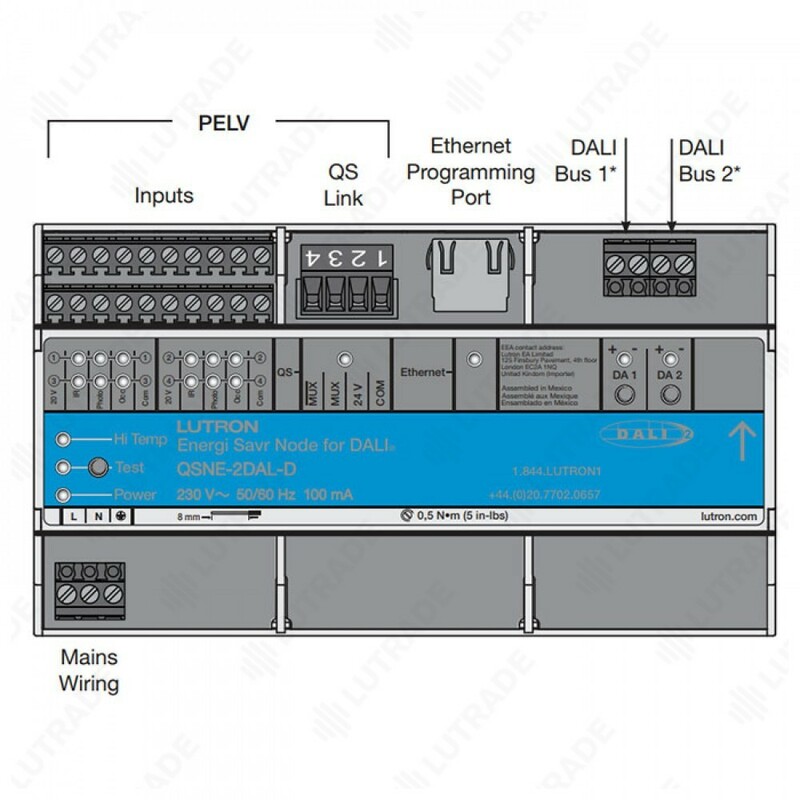 • DALI Bus Output: 18 V - 128 mA guaranteed supply current, 250 mA maximum supply current per bus. • Lutron Quality Systems registered to ISO 9001:2015. • For commercial use, Class A only. • Ambient Temperature Operating Range: 0 єC to 40 єC. • Relative humidity: less than 90% non-condensing. DIN rail and dead cover. • Width = 9 modules (161.7 mm). • An Apple iPod touch or iPhone mobile digital device with the Energi Savr app is required for programming Energi Savr Node systems. • The Energi Savr app is available from the App Store online store. 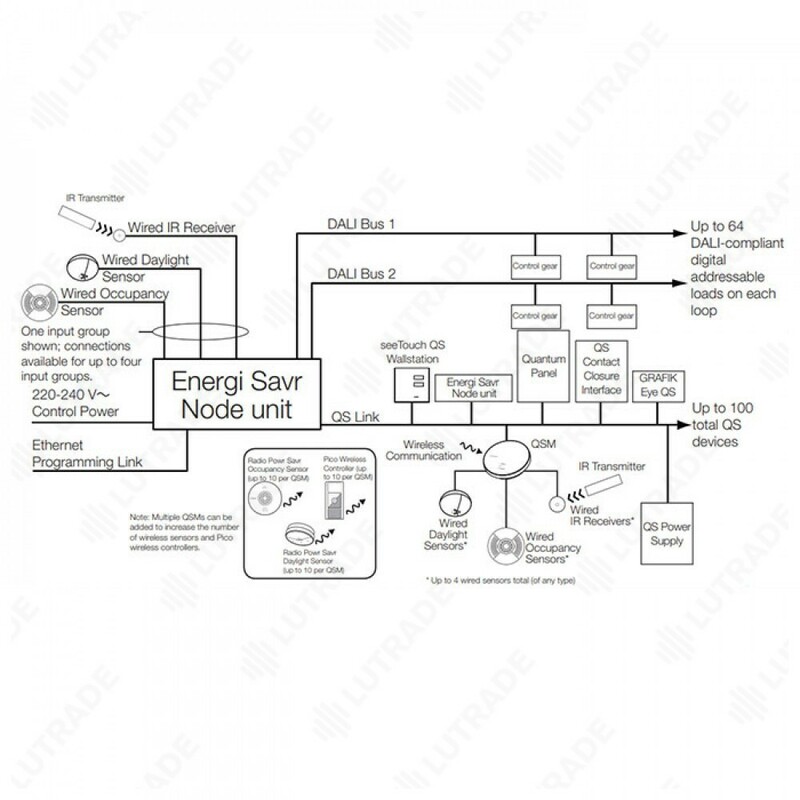 • The Energi Savr app cannot be used to program the Energi Savr Node units when installed as part of a Quantum system. • The Apple iPod touch or iPhone communicates with the Energi Savr Node unit via a WiFi router (not included). • See the Programming Options section for further information. addressed and grouped into 16 zones. of 128 mA to power each bus. bus power supply with polarity indicated on the unit. connection to the DALI bus. • Short circuit protection with automatic re-start. toward the 100 device limit. • Each assigned zone counts toward the 100 zone limit. • 100 wired or wireless occupancy sensors. • 100 wired or wireless daylight sensors.